Maplewing is finally and officially a finished object! There were a few modifications to the pattern: the yarn used has a finer gauge that what was recommended, so I used US 2.5s instead of US 5s. Since I had a shorter row gauge, but still had quite a bit of width, there is an additional repeat of chart B, and I used a double-stranded German twisted cast-on. The edges were intentionally blocked asymmetrically to mimic a Maple Leaf. What do you think - did it work? Knitting time: early April 2009 to June 22, 2009. Maplewing came off the needles about two weeks ago, and I suddenly realized that I needed blocking wires. A few friends said they would lend theirs, and after trying to remember who they lent them out last to (or trying and failing to locate them); I ordered a set for myself. The wires arrived yesterday evening. After evening duties were completed, I soaked the shawl for about 60 minutes in wool wash. Seven wires were painstakingly wound through the outer points and central "spine" panel. After shaping and re-pinning the shawl, I checked my watch and realized that it took 140 minutes!!! On top of this, the only space large enough to pin it out was the queen size bed that I sleep in, so sleep was found elsewhere in the house. The shawl increased 55% in length and 75% in width. Look for final pictures in the near future! Sometimes you find yourself working on unseasonable items. Take for instance my shawl project of the last five weeks. That's right, I said five. Hey now, there's over 47 thousand stitches in this shawl thus far. Is it just me, or does it look like a whole lot less work than this? I decided to go crazy and knit the "tall" version of Maplewing. (Here's a Ravelry link to the project.) I loved the pattern instantly because of the leaf motif on the edge, the faroese shoulder shaping, and how it easily translates as a Maple Leaf! My version has a few deviations from the original pattern: it was knit with an extra leaf motif to the border on chart B, and has a double-stranded twisted German cast-on. Ok, the skein on the left is the what I started with - Wollmeise lace-garn in Terra di Sienna (Earth of Sienna) dark. 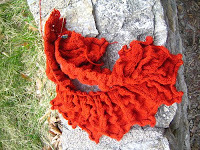 Next to it is a picture of the shawl taken 3 weeks ago before the hosta below the stone wall exploded. Notice anything? Like how stinkin' hard it is to photograph this color?!? Seriously, none of these shots are accurate. The skein at the left is the closest depiction. It's a really pretty color - certainly not hunter-orange, nor a dull terra cotta. Honestly, I can't wait for this shawl to grow up and become a huge wispy leaf of a thing. I'll be great to wear it this fall! Is there anything better in spring than sweet & tart rhubarb and a great pair of socks on the needles? I think not. By now you all know that I love to knit socks. For a while now I've been thinking about Sue Grandfield's free Wollmeise Poppy sock pattern. (It's a Ravelry download.) Sue has also created a medium weight version. While digging through my stash, I thought "Rhabarber" (rhubarb) and "Frosh" (frog) 100% Wollmeise sock yarns complimented each other well. After knitting the corrugated ribbing, I absolutely loved the combination. Unfortunately, the sock itself is too small to go over my high insteps. So, I'm deciding whether to change the classic Kaffe Fasset pattern motif, or to make short socks. Whatever decision is made, I will finish these socks-- and the second one will be knit with reverse colors! Since it's the perfect time, here's a great recipie for spring. Enjoy! - 2 tablespoons orange juice. Sometimes I use orange zest, or other citrus juice. Butter an 8 x 8 inch baking pan. In a mixing bowl combine and toss the rhubarb, strawberries, sugar, cornstarch and orange juice. Transfer mixture to the buttered baking dish. Mix the oats, brown sugar, flour, cinnamon and salt in a bowl. Cut in the butter with the mixture becomes coarse crumbs. Mix in chopped nuts and spread over the fruit mixture. Bake until the topping is golden brown and the fruit is bubbling (25-35 minutes). Navajo Ply, certainly not on the Fly. I started by picking out the roving below -- kettle dyed Jacob Humbug roving by Shunklies Jacob sheep are rugged, beautiful two or three toned animals that often have 4 horns. Their fleece is rough and tumble as well. It's not soft and plushy like merino, but certainly seems to be hard-wearing stuff. This particular roving has been dyed to create a perfect ombre from color A to B to C, then C to B to A. I really didn't want to disturb the way the color was dyed, so I went ahead and spun a single ply, then used the navajo method to create a 3-ply yarn. The final yarn was wound into a ball, and it certainly reminds me of a ball of Noro's Kureyon or Twisted Fiber Art's Dutchess once wound. This was spun around the time that my niddy noddy broke (it was used-- not that nice to begin with, and the wood split where a screw was holding it together), so I have no idea what the yardage is. I'm guessing that it's around 110 yards, and it's a worsted to aran weight yarn. With it's rugged-ness I'm not sure I'd like to wear a hat from this yarn unless it was lined with something lush. An alpaca, angora, or cashmere/merino blend would be great! You might remember the roving below from March. It's Bluefaced Leicester superwash (BFL- "the poorman's cashmere") inspired by spring flowers, even though I dyed it the previous fall. I don't know why, but I created seriously long repeats! Whenever you dye superwash roving, it has to be braided first (or set in a crochet chain). If you don't do this, the fiber can (and often will) detach from it's neighbors, and you won't have roving anymore! The resulting yarn is fantastically soft, and is a dk weight of unknown yardage. I think this yarn is destined to become a pair of mittens! I think there might be enough for another small project, too. Perhaps I should set a goal to knit with my handspun! All in all, they're my favorite socks knit to date. Navajo Ply on the Fly! A short time thereafter, Cathy and I were able to meet-up at the American Swedish Institutes' knit-out to celebrate the final week of the Bohus Stickning exhibit in Minneapolis. See that wee loop on top? That's where the crochet chain was set to begin. Although we're really in a chicken-before-the-egg situation here. First, she had to prep fiber to spin a single: Isn't that shawl gorgeous? Go here to learn more about it. Once a section of single was spun turning the spindle to the right, Cathy stopped and picked up the loop from above. Here she pulled the single through the loop creating thirds. This also creates a crochet chain: Here Cathy plys the chain together by spinning the spindle in the opposite direction as the single: Once complete, she attaches the loop and spins another single section. How cool was that? 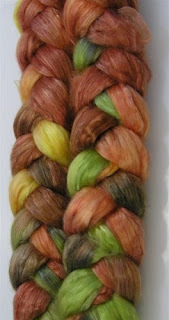 Now, I think that spindle spinning is pretty amazing - perhaps I should give it a try again. Honestly though, I just love the speed and ease of a wheel. Do you know how long it would take for me to spin a four ounce bundle of fiber? Yeah, neither do I-- but I'm going to guess that it'll be just about forever! Cathy is to Twisted Fiber Art as I am to Wollmeise. About a year ago I picked up a 4 oz. bundle of "Sleek", a superwash merino/tencel blend by Twisted Fiber Art roving. The colorway is Scorched. Sometime in March it just looked like spring to me - and a great color for Cathy. Cathy just received the skein on Saturday, and I can't wait to see what she knits with it! Another Minnesota knitter fights with her fiber addiction.